Hello, again, friends! It's Andrea back with you today. In case you haven't finished your Christmas cards, here's another one to inspire you (hopefully). 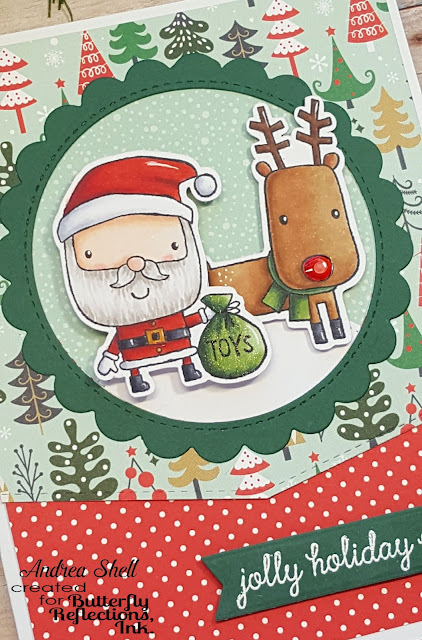 I'm taking my kiddos to visit Santa today, so a Santa-themed card was in order! This Santa and deer from Reverse Confetti's Jolly Holiday are some of the cutest I've seen. After stamping both with Memento Tuxedo Black Ink, I colored them with Copics and cut them out. Naturally, I couldn't resist adding some highlights with a white gel pen. I also brushed on a bit of clear Wink of Stella and gave Rudolph a shiny nose with Glossy Accents. 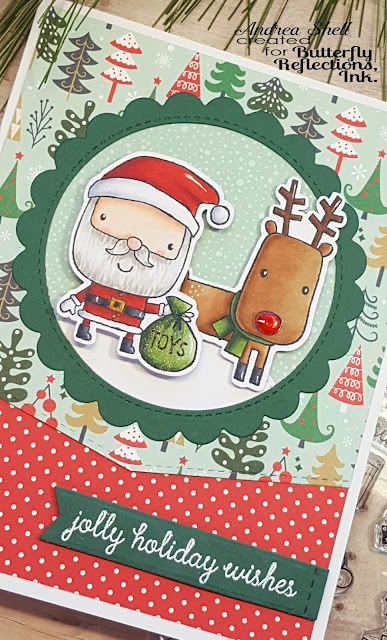 I just love the whimsical nature of that patterned paper, don't you? It's from Echo Park Paper's Deck the Halls paper pad. The tree paper was die-cut with MFT's Stitched Basic Edges Die-namics. The frame was created by layering two dies together. For a similar look, you can use Lawn Fawn's Outside In Stitched Circle Stackables and Fancy Scalloped Circle Stacklables Lawn Cuts. After adhering all of my die-cuts to a white card, I popped up my colored images with foam tape. Santa received two layers of foam tape, except for where he overlapped the reindeer. I die-cut a banner with MFT's Stitched Sentiment Strips. To achieve a shorter strip, I used partial die-cutting. I stamped a sentiment from Jolly Holiday with Versamark ink and white heat-embossed it.